Ah, yes. There’s Sammy, half-asleep on his desk as the sun begins to climb into the winter sky. It’s been common knowledge for years now. Adolescents do not perform well in the earlier morning hours; younger children do. And yet I can’t think of a single school system that has reversed the bus runs to bring the kiddies in earlier and the teenagers in at nine. In fact, my old district pushed the starting time for high school back, from 7:30 (homeroom, 7:40 period 1) to 7:15 (without a homeroom). One more example of the disconnect between reality and beaurocracy: studies show that adult brains need a break after about 40 minutes of an activity. My district is now the proud sponsor of 78 to 90 minute classes – traditional classes where kids who couldn’t focus for five or ten minutes are now – for use of a better word – trapped. Who made the decisions to do away with our attendance policy, give 50 points for work never performed (instead of 0), institute an uneven and unexamined retake program, and the logistical nightmare/abject failure known as ZAP (Zeros Aren’t Permitted), and instituted “common time” so that kids who refuse to do work or make up work outside of school have time to do so during the week? While teachers and students were on the committees that examined some of these options, most came out against them. It didn’t matter. These decisions were made unilaterally from the top – often by one person who had absolutely no business or training making them. Teachers who disagreed (as in those who refused to give the 50 points for 0 on the grounds it was fraudulent) were told they would be disciplined. Why were these decisions made? Two reasons, of course. Appearances trump achievement, and these procedures make those grades look good. All we have to do is coach, and coach, and coach, the middle school kids (who receive much of this enabling) to do well on the CMT – coach beyond all acceptable levels of preparation. If we aren’t then able to coach them quite the same way for the CAPT, we’ll blame the high school teachers (exactly what happened in my district: the New Haven Register quoted our acting superintendent — now assistant superintendent – as saying that while our middle schools were doing a fabulous job, our high schools were “collapsing”. Any high school teacher could tell you (and him, and probably did) that the kids came in woefully unprepared precisely because of that feeble middle school “pedagogy,” but of course they’re just teachers (or as a former superintendent referred to us, “factory workers”). There are no stipulations that those who make policy for or administer our schools have any classroom experience whatsoever, which explains so many of the failed initiatives and boneheaded decisions affecting our youth and our future. And yet many of the poor decisions made, in my experience and I am sure in many others, are made by those who were indeed teachers, sometimes good ones, and for many years. What in tarnation is happening there? Two things, I suppose: fear and ego. These folks move up the ladder, take a salary spike, and start hobnobbing with the buffoonery at the top. They may not agree (at least at first) with the bad policies, but fear of losing their position keeps them quiet at best and acquiescent at worst. Then it seems to become a matter of ego: the power, the prestige (such as it is) – they seem to convince themselves that they are part of a wondrous hierarchy with equally wondrous ideas, one of which is to keep those pesky teachers in line and get those grades to look good – and they follow that broken, discredited road, probably convincing themselves they’re on the right track. How can we start to remedy these unfortunate realities? Of course superintendents, consultants, publishers, and administrators should be required to have valid classroom experience – but a simple requirement isn’t enough. Unfortunately the other necessity- that, once out of the classroom, these people do not forget what being a teacher is like, and continue to support good teachers – isn’t something one can legislate. There has to be ongoing classroom experience. Also, teachers should be able to evaluate their superiors, the way students are now able to evaluate their teachers. Believe me, if this were possible in my district, things would be better there today. As it is, teachers won’t stand up, won’t speak out and won’t take a vote of no confidence, all out of fear. This needs to change also. Until teachers are indeed able to formally evaluate administrators (the twelfth of never? ), they have to have the courage and integrity to speak out. I found it necessary after 18 years in my current district to leave. Most teachers I spoke to wouldn’t go beyond complaining and cynicism, usually from fear of losing their livelihood. That has to change. Also, those making policy must be required to read, and act on, books like Paul Tough’s How Children Succeed and the aforementioned The Smartest Kids in the World. What’s wrong with education in the United States, according to these slender and very readable tomes, can be stated quite succinctly: we fail to teach character (i.e., teaching kids to fail and persevere, which prepares them for life), and school here is not taken seriously enough, it is too easy, and the philosophy of self-esteem above all has bankrupted rigor. None of the recent or current government initiatives address any of these realities. The United States spends more on education than any country except Luxembourg and has mediocrity to show for it. Where does it start? At the very top, clearly. I wrote to George W. Bush when No Child Left Behind was first making its appearance, exhorting him to look at the realities in the classroom. Laura Bush sent me a form letter extolling the virtues of the now-repudiated program. NCLB was right in pushing for high standards, but the pedagogy in place was not designed to produce them, and this pedagogy was not replaced, nor was the entrenched beaurocracy that perpetuates it. NCLB was doomed to fail. “I tried the first time!’. To say this to young people everywhere was, of course, irresponsible. But it also shows that Clinton had no concept of what it was like to be in front of a classroom facing stoned kids, like the kid I was trying to get to practice speaking basic Spanish and failed because he was busy licking the inside of a potato chip bag. Clinton had, evidently, no inkling of the issues rampant drug use causes for schools. When will we begin to see that there are answers and that we need to begin implementing proven and successful strategies before it is too late (although considering that many of our kids are graduating without skills sufficient to hold a decent job or succeed in higher education, it already is late -very late). And the first thing on the agenda is to find leadership that works, that cares and that can implement the vision – from those on the front lines or with their continued input. The stakes are too high to wait. Christine Sullivan was born in Albany, NY. She went to college in Connecticut and returned here to teach, and thus has lived here for forty years. She taught Spanish in Catholic schools in Hamden, New Haven and Fairfield and ESL in New Haven. For the past eighteen years she taught Spanish for the Milford School District. The Education racket is a big, wide open secret. Today, the word educator hides two classes of professionals: teaching and non-teaching professionals. The non-teaching professionals consist of literacy facilitators, department chairs, consultants, principals and vice principals, social workers, guidance counselors and anybody else with a college degree hired to fact find, look into, observe, suggest, oversee, but not teach. They will say in their defense that they are teachers, that they teach teachers, when in reality they think they are smarter than teachers for either getting out of teaching or, smarter yet, never having been a teacher. I see a radically new way of teaching. It will evolve out of sheer necessity, out of a need to recapture the essence of teaching, or the real pursuits of the intellect. If you can envision city schools contracting with certified teachers directly, as in a practice as similar to a physician’s practice or a law practice, envision the 21st century teacher. That is when the exposures come and the frauds either run for cover or try to carve out phony jobs for themselves that do not involve teaching, for they disdain teaching. Actually most that I’ve seen are terrible teachers, but still like to consider themselves “educators.” They have indeed disgraced the name of educator until, with me, it is a pejorative. So I am a teacher. They can not get pass that, nor understand my meaning when I curse them with their own bankrupt edu-constructions. All of the central offices nationwide are big money draining systems. Here is the nexus of the education racket: the non-teaching professionals who have found a way to earn up to six figures in education calling themselves educators without seeing one child in their administrative careers. Indeed, they refuse to have anything to do with children, except, maybe, their own. They are only an asset to them, certainly not to the millions of public and mainly city school children who get short changed by them because so much money is spent on them, and the children get so very little wisdom from them in return. This isn’t illegal, but it is certainly immoral. I would like to make it a requirement for all certified personnel in our public schools to have to be teachers, not the bogus “educator.” Teachers have classes. This means that from the superintendent on down, if he is certified personnel, he should have at least one class of students to teach and be responsible for daily. At some point in even a superintendent’s day, he or she should have to say, “I’m sorry, I can’t have a meeting with the mayor at that time—I have a class.” Think of the classroom size reducing to a manageable size, resembling those of functioning and private schools. School children will benefit only when teacher skills and abilities are the status in the public school systems. This will immediately drive out the frauds who have little time for students and those “educators” who got out of the classrooms because they were not good in them. But also it keeps principals and superintendents honest. For everyone must do what is required of a teacher, for all certified personnel would be teachers. Central office would not exist, but small offices in schools, where department chairs, vice principals, and principals all work, handled administrative responsibilities as well as teach. All personnel not certified should make no more than clerk types- even less than secretaries and custodians, for secretaries and custodians serve legitimate functions in the school and are truly needed. I am speaking of personnel so esoteric that they can disappear for weeks, months, and years in personnel offices and no one even knows it. And indeed, this is the “educator’s” hope, their prime reason for getting a board or out of classroom job. This is the racket part of education that is a shame and a scandal, and that should immediately be abolished. So envision, no more central offices. They are extinct, like dinosaurs. The superintendent is stationed at one of the schools. His deputy superintendents are scattered throughout the schools, depending upon the size of the school system. The department chairs are master teachers and of course, have classes. In fact, all of the certified staff has classes. The superintendents are master teachers and come through classes from time to time to show new or intermediate teachers the art of veteran and competent teaching. They show that it can be done, or it cannot be brought to teachers as new programs. Remember the unfair and totally inaccurate phrase “drill and kill?” Looks like it turns out drill and kill was really drill and master, or drill to master. (If you don’t believe me, just think of what you have to do to master a sport.) With the Common Core State Standards Initiative in 46 states upon us, a rigorous, knowledge-based curriculum of any sort is a requirement. Do you teach with a focus that disseminating knowledge and skills to your students is the goal? If not, what is your goal in your classroom? What kind of curriculum do you use in your school? Do students leave your class knowing something they didn’t know before? Is that something foundational, substantive, or mired in what the student thinks, the student’s feelings, void of facts and proof? Let’s discuss: How do you teach your knowledge-based curriculum? Enter your host’s home happy to see everyone. Even if you are tired, stop to thank your host for inviting you. Bring along a little gift of appreciation when you visit. It should be a simple gift of flowers or a fruit and cheese basket, or a box of good candy, a token of your appreciation for the household’s offered hospitality. Once shown to your room, remove items from your suitcase and put them and your suitcase away. Usually there is an empty drawer for the guest. Put your undergarments and toiletries there. Hang up your clothes. Slip your suitcase under the bed if there is no other space for it. Don’t live out of your suitcase. Ask permission to use their computer, but don’t monopolize its use. It is rude and unfriendly to hold up in your room, working on something on a computer when you are an invited guest. While on the Internet, stay away from questionable sites. Keep your room area clean. Pick up after yourself as you go. Keep a bag for your used clothing so that you can help keep things neat. Be time sensitive when you’re in the bathroom. Leave everything clean and dry, free from hair in the sink and stray tissues and cotton balls on the vanity. Fit into the flow of the household schedule. If everyone gets up “at the crack of dawn,” then you do as well. If you’re a late person, smile at the experience. You can always look at it as an adventure. Pitch in during the day with clean up. Ask to help your host with the dishes. It’ll be fun cleaning up the kitchen and listening to the latest songs, or the neighborhood gossip. Be friendly to your host’s friends that come to visit her while you’re there. Ask questions of the friend that will keep her talking about herself, or about her friendship with your host, and the three of you can laugh at the funny things your host and her friend have gotten themselves into at their school, or on the job. Visits are always fun when everyone is included. Before you leave, double check the closets and drawers to make sure that you have packed everything. It is an inconvenience to have your friend mail you forgotten items because you were hasty in packing. 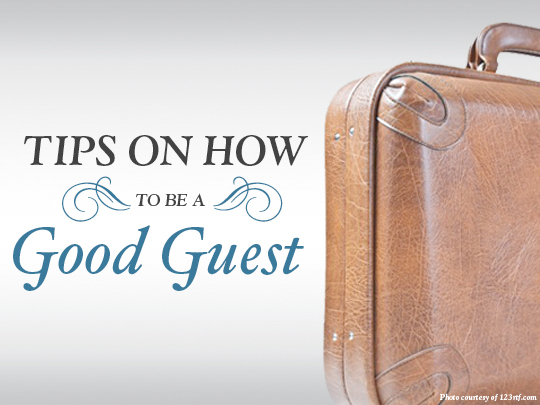 Do not leave the house without telling your host that you have enjoyed your stay. When you get home, write a thank-you note within a week of the visit, thanking your friend and her family for their warm hospitality. Return the hospitality in due time by inviting her to spend time at your house. We all walk, and whether we like it or not, people get impressions of us by the way we carry ourselves. That graceful gait is your poise and confidence being reflected in how you walk. Or that slump and shuffle an indication of your insecurities with the surrounding environment. So walking with your back straight, not sloughed, stepping decidedly and softly, one foot in front of the other if you are a woman, is the best way to say, “I’m here. Take note.” Now there are many ways to say this. In a museum, it is a quiet, but attentive meander. On a busy street, it is purposeful stepping and a smile as you exchange greetings with a fellow pedestrian. There are many aspects to walking. When you have to catch that bus, it is a quick sure stride, not bumping into anyone, but a deliberate thoughtful advance toward the bus. 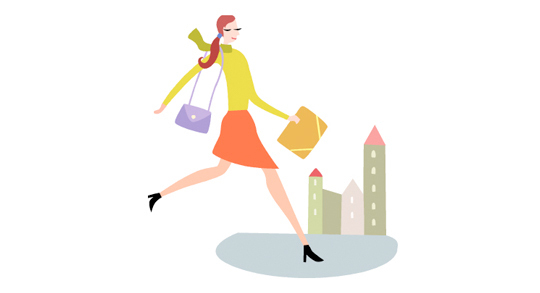 When walking, have a balanced gait, walking as if you have someplace to go. Even walking to the park to sit and enjoy a sunny morning deserves your best effort. It is not the win, but how you play the game that counts. That is the main point for a good sport, and for a young man or young lady of good character. The good sportsman plays fair. He has respect for the rules and for the authorities of the game. He doesn’t shout and pout at the officials. He plays hard and wins humbly. He plays hard and loses gracefully. He shakes hands before and after the game, no matter who his team is playing; no matter who wins or who loses. How can we take these qualities off of the court and into the world of school, business and social success? First, play fair. Don’t cheat on tests. That means you have to study, study, study. Studying gives you knowledge first, then expertise, and finally confidence. But knowledge is the door opener. Next, don’t cheat in business. Don’t sabotage a colleague’s project because you didn’t think of it, or because it goes against your business model, or because you are afraid he may get more of the boss’s attention. Bad feelings from others aimed at you will be around longer than a money bonus. Quiet seething from colleagues is dangerous for your career health. And finally, don’t cheat in your social life. Be open and honest with all of your family and friends. That does not mean reveal what you want kept to yourself, or give everyone in your life special considerations you only feel for a select few. Just be honest, be fair, and be a good sport.